As a thrifty shopper, I love stocking up on summer items when the sales are right. Currently, shoe company Juil has sandals, the Brio style, that usually would cost $135 and are on sale for only $89. After wearing the shoes for a couple weeks, I wrote the following review to cover the fit, comfort and style of the product. Because I’m a parent of two children under age four, I need practical shoes. I’m a mom, but I don’t want to wear house slippers all day! One of my fondest memories would be attending New York Fashion Week as a guest in 2008, when I marveled over the beautiful designs I wanted to wear. I want my wardrobe to live up to the designs that I covet on the runway. As I tried out my new sandals, I found that comfortability met style to make a pair of shoes I’ll wear year round. When I tested the black sandals, I examined the fit and I determined that the shoes come true to size. As my feet are a pretty solid size 8 1/2, I was relieved that the 8 fit perfectly. Don’t be worried about going a half a size smaller that you might normally need, as the company doesn’t carry half sizes. Going a half a size smaller fit me really well. Regarding the comfortability of the product, the shoes felt great under my feet. With a cushiony layer on the bottom, the shoes made me feel very relaxed. If you are going to use the sandals for a long walk before really breaking the shoes in first, wear toe gel cushions. As with many leather thong sandals, the leather can rub between your toes if you don’t wear the shoes in for a couple days. The more I wore the sandals, the better they felt on my feet. Examining the style, I liked the style of the shoes. My shoes would look right with a dress, skirt, pants, or shorts. The shoes go well with a laid back, outdoorsy look as well as a dressed up, trendy look. Because I like wearing sandals year round, I wore the shoes to the park as well as to church. My background of doing volunteer work in the fashion industry helped me narrow down the color I wanted. I picked out the black pair because the shoes can go with anything. More adventurous fashionistas might want the magenta, which looks very natural and uplifting for spring. The metallic blue could add some fun to an outfit. As the season is currently winter, the black seems the most practical, but the colorful pairs would be in season for spring and summer. Personally, I was excited when the shoes arrived because of the packaging. The shoes come with a notepad and a lime green bag. Last night, for family game night, I used the notepad when I played a board game. The lime green bag has worked great as an impromptu diaper bag that I’ve kept in the car for emergencies. I’m going to keep the bag in the car with some paper towels, wipes, and other necessities for a road trip I’m taking for the holidays. 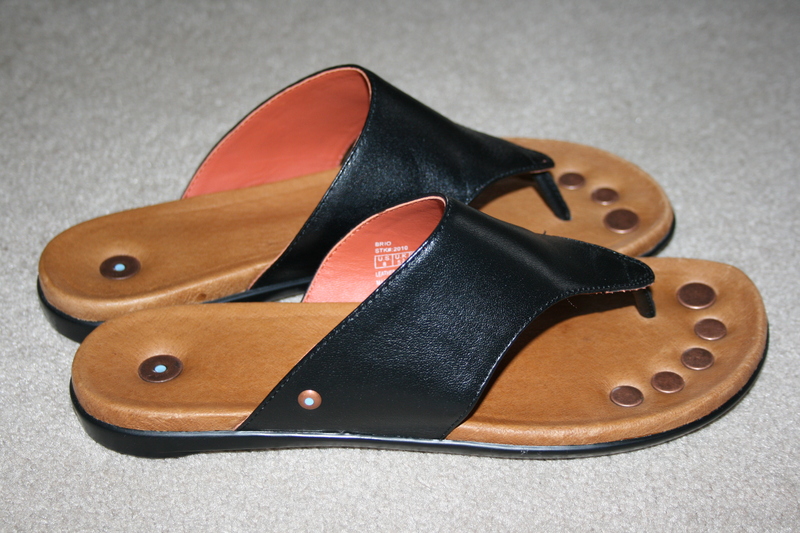 For me, the black sandals will replace my house shoes for winter and will become my everyday shoes for warmer months. I’ve worn the shoes for weeks because they’re quick to slip on to go get the mail and to run to the grocery store. As a mom with a love for fashion, I found the right pair of shoes for me. I could run after my little ones without my feet feeling horrible. I love being comfortable and feeling supported without sacrificing my personal style. I received a free product, but it in no way influenced my opinion.